Your Raspberry Pies have been getting a lot of use... We've got 8 Pies in total. Got a reasonably steady turnout at the dojo, 75-85 kids turning up each week. Note that these instructions are for running Docker-Toolbox for Windows. Running Docker natively on Windows is not supported. 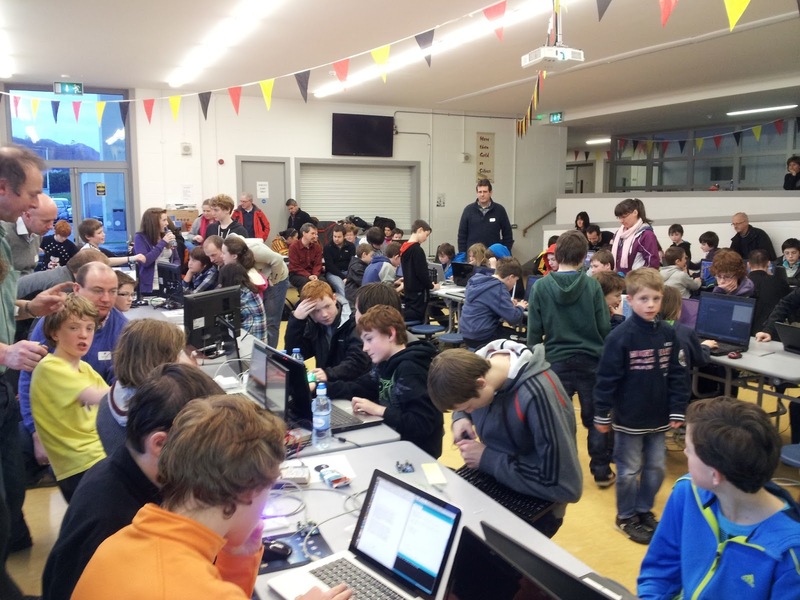 These instructions are provided for individuals wishing to run cyber-dojo locally on their personal Windows laptop. 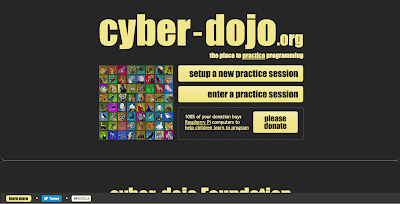 Now use this cyber-dojo script, from your cyber-dojo server, to run your own cyber-dojo server. 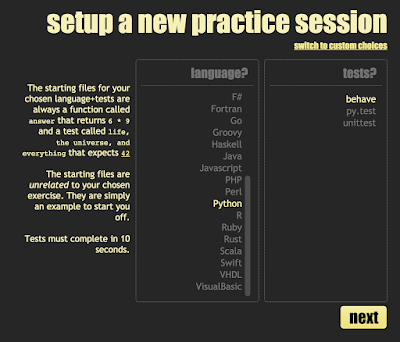 This page holds the choices where you select your language and test framework (eg C#, NUnit) and exercise (eg Fizz Buzz). This start-point is called languages. By default, the languages+testFrameworks is created from the languages_list file which contains a list of repo-URLs in the cyber-dojo-languages github organization, each of which contain a manifest.json file. By default, the exercises list is created from the start-points-exercises github repo which contains instructions text files. This page holds the customized choices. By default, custom is created from the start-points-custom github repo which contains manifest.json files. 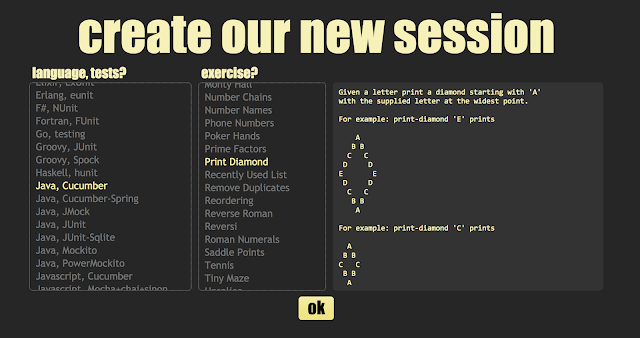 Start-points are controlled using the start-point command of the cyber-dojo script. cyber-dojo's new architecture has customisable start-points. If you want to use your own start-points you do not need to build a new web server image. This file must specify the type of start-point. Here's an example. Here's an explanation of the manifest.json format. which attempts to create a start-point called adams from all the files in the douglas directory. If the creation fails the cyber-dojo script will print diagnostics. It will be updated properly soon. Note how each repo's .travis.yml file simply runs the run_build_image.sh script which builds and tests the docker image and any associated start-point code. In particular the script augments the Dockerfile commands in various ways (eg adding users for the 64 avatars). Alternatively, if you are building your docker-image using a raw [docker build] command you must base your docker-image FROM a cyber-dojo-languages dockerhub image. Make this docker-image unit-test-framework agnostic. If you are adding a new unit-test-framework to an existing language skip this step. Use the Dockerfile to build a docker-image for your language. $ docker build -t cyberdojofoundation/lisp . which, if it completes, creates a new docker-image called cyberdojofoundation/lisp using the Dockerfile (and build context) in . (the current folder). Repeat the same process, building FROM the docker-image you created in the previous step. The first line of this file must name the language docker-image you built in the previous step. 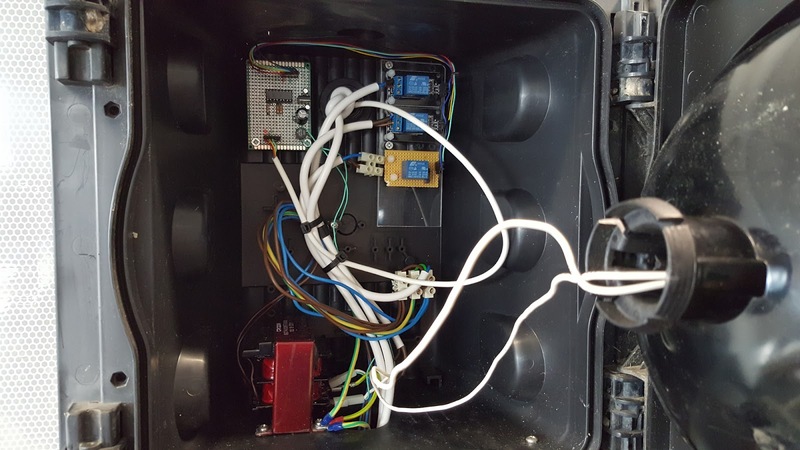 cyber-dojo uses this to determine the test's traffic-light colour by passing it the stdout, stderr, and status outcomes of the test run. Use the Dockerfile to try and build your language+testFramework docker-image. $ docker build -t cyberdojofoundation/lisp_lunit . which, if it completes, creates a new docker image called cyberdojofoundation/lisp_lunit using the Dockerfile in . (the current folder). Use the new image name (eg cyberdojofoundation/lisp_lunit) in a new manifest.json file in a new start-point. 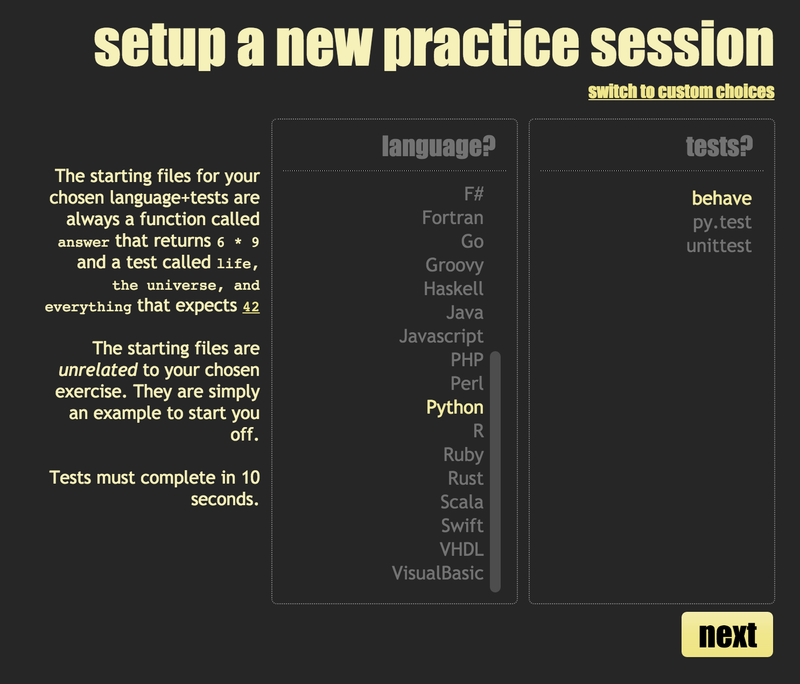 The name as it appears in the start-point setup pages where you select your language-plus-test-framework. For example, "Java, JUnit" means that "Java, JUnit" will appear as a selectable entry. A single string with the major name first, then a comma, then the minor name. Filenames that will be visible in the browser's editor when an animal initially enter's a cyber-dojo. Each of these files must be a plain text file and exist in the manifest.json's directory. Filenames can be in nested sub-directories, eg "tests/HikerTest.java". Must include cyber-dojo.sh. This is because cyber-dojo.sh is the name of the shell file assumed by the runner to be the start point for running the tests. You can write any actions inside cyber-dojo.sh but clearly any programs it tries to run must be installed in the docker image_name. For example, if cyber-dojo.sh runs gcc to compile C files then gcc has to be installed. If cyber-dojo.sh runs javac to compile java files then javac has to be installed. The name of the docker image used to run a container in which cyber-dojo.sh is executed. Do not include any version numbers (eg of the compiler or test-framework). The docker image must contain a file called red_amber_green.rb in the /usr/local/bin directory. The runner uses this to determine the traffic-light colour of each test run outcome. For example, here's the one for Java-JUnit. The extensions of filenames that identify source files which are listed above the output file(s) in the filename list. The first entry is also used when creating a new filename. For example, if set to ".java" the new filename will be filename.java. If you only have a single filename extension you can use a single string instead of an array containing a single string. The maximum number of seconds cyber-dojo.sh has to complete the tests. An integer between 1 and 20. The number of spaces a tab character expands to in the browser's textarea editor. When the runner runs cyber-dojo.sh, it it often creates files. All text-files that are created are returned to the browser unless their name matches any of the string regexs. An array of strings used to create Ruby regexs, used by cyber-dojo, like this Regexp.new(string). For example, to hide files ending in .d you can use the following string ". *\\.d"
Used on the dashboard to show the test output line (which often contains the number of passing and failing tests) of each animal's most recent red/green traffic light. Useful when your practice session starts from a large number of pre-written tests and you wish to monitor the progress of each animal. An array of two strings used to create Ruby regexs. 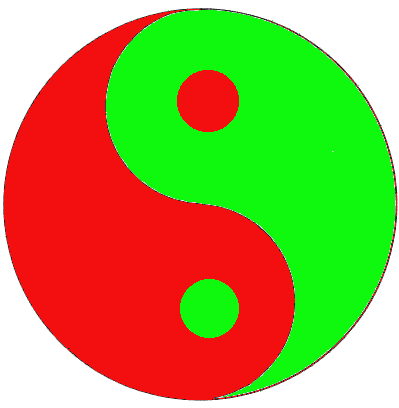 The first one to match a red traffic light's test output, and the second one to match a green traffic light's test output. Filenames whose appearance is highlighted in the browser. This can be useful if you have many "visible_filenames" and want to mark which files form the focus of the practice. An array of strings. A strict subset of "visible_filenames". once I've got the output parse functions inside the start-point volume I'll be switching the public cyber-dojo server to this image and updating the running-your-own-server instructions.